Ald. Peter Braithwaite (2nd) speaks at a City Council meeting in April. 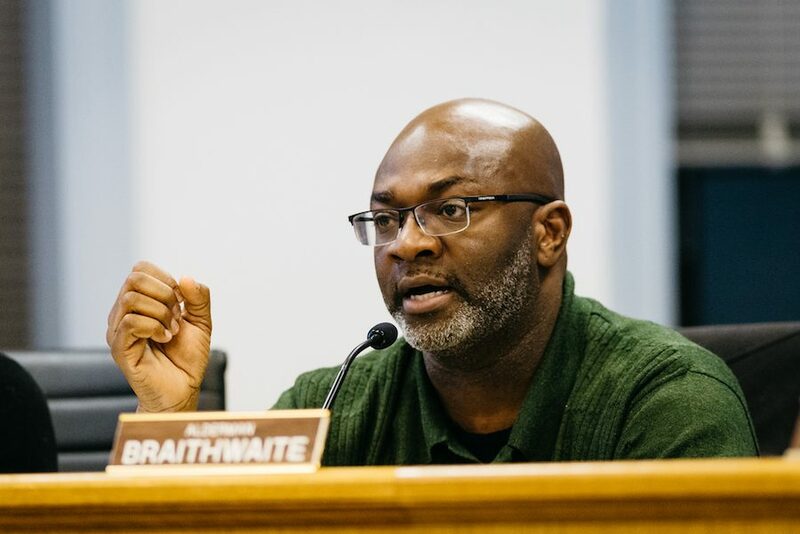 Braithwaite introduced a motion at Monday’s meeting to remove youth and young adult programs from a list of potential city services to be reduced or cut in the priority-based budgeting process. Aldermen unanimously approved a motion to remove youth and young adult programs from a list of potential city services to be reduced or cut as Evanston prepares for its 2019 budget. The motion, introduced by Ald. Peter Braithwaite (2nd), comes after residents expressed their concerns about possible budget cuts to programs provided by the Youth and Young Adult division. The programs were listed on a survey released by city staff on May 10, which asked residents to rank city programs so their feedback can be considered for the 2019 fiscal year budget. City manager Wally Bobkiewicz told the Daily in May that Evanston is starting its budgeting process earlier this year to gather resident input and make the process more transparent. The survey is part of that effort to kickstart the process and get feedback, especially with next year’s budget containing an estimated deficit of about $3 million. The survey contained 46 items and asked residents to rank their top 10 and bottom 10 priorities. It was available online and residents could fill out paper copies in various locations across the city. According to city documents, a total of 3,304 residents participated in this survey, which closed June 7. Among the programs they ranked as most important are the city’s mental health board, its Youth and Young Adult Services and the victim advocacy division of the Social Services department. Services like Divvy Bikes and vacation rental permit administration ranked at the bottom of residents’ priorities. While the survey was being administered, residents approached aldermen and city staff with concerns about the “arbitrary” nature of the programs included, as well as the potential consequences for services vital to certain communities in Evanston. Braithwaite said the concerns brought by his constituents, combined with a lack of trust in the budgeting process, led him to propose the motion. “(I’d like to use this) as a way of signalling to our town and our communities that we have heard their support for the programs,” Braithwaite said. Patricia Efiom, Evanston’s Equity and Empowerment Coordinator, said that she and her staff will be focusing on ensuring the budget cuts are equitable. She said communities that are typically underserved in Evanston — like low-income residents and minorities — rely most on the programs that residents prioritized in the survey, and that it is crucial for the city to reach out to them. She said she heard from residents throughout the survey process who expressed their concerns about the included programs and limited choices. City staff will present another budget overview at a meeting on July 30, Bobkiewicz said. After that, a draft of the budget is set to be sent to council for review in October. Ald. Donald Wilson (4th) said he wants to stress the fact that the survey and budgeting process are not meant to represent a “cut list” but incite discussion and open conversations on services offered in the city. “We’re trying to provoke those conversations in the community, and we’re trying to get feedback from you,” Wilson said.